75 Ohm RG59 coaxial cable in a 100 m coil. 75 Ohm RG59 coaxial cable + four 0.5 mm cables, in a 100 m coil. 75 Ohm RG179 mini-coax cable in a 100 m coil. 75 Ohm RG179 mini-coax cable + four 0.5 mm cables, in a 100 m coil. 50 Ohm RG223 coaxial cable in a 100 m coil. LAN CAT5 E UTP twisted pair cable cables, in a 100 m coil. 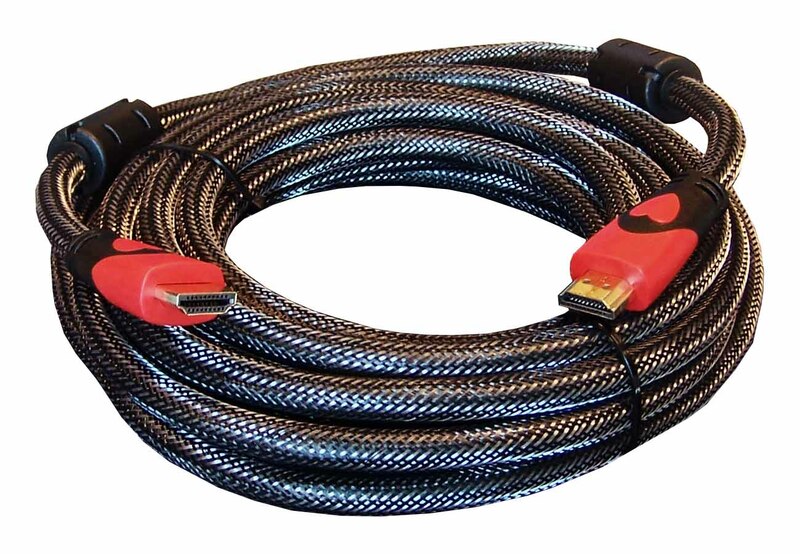 HDMI cables are used to connect DVR to TV monitors, today commonly used in CCTV applications. Short cable, 1 to 3 m. , can be purchased in any supermarket, but they are not suitable to longer wiring. These high-quality, double shielded HDMI cables are suitable to carry Full HD 1080P video up to 20 m.
This cable is ideal for connecting a wired camera to a monitor or operating device (Quad, DVR, PC etc) over a short distance. It is a pre-packaged 20 metre cable with RCA Audio, BNC Video terminals and a jack for the power supply, ideal for small systems. The RE-CT1 cable can also be used to connect wired cameras to external radio transmitters (RE-TX2...5), when it is preferable to locate these at a distance from the camera, for example to get round an obstacle. The key advantage of this cable is that it contains 3 wires inside a single jacket measuring just 4 mm in diameter, which is easy to fit. The attractive white/ivory colour of the jacket means that in emergency installations the cable can be left on view without spoiling the context. It is not possible to connect up two or more RE-CT1 cables, as this type of cable is not suitable for distances over 20 m.
RE-CT1 is not suitable for IR cameras and cannot be used to power up auxiliary devices besides the camera. 1.5 m combined audio/video cable for very short connections, such as monitor to video recorder. This is supplied with all outdoor RadioEye® receivers and transmitters. It comes with RCA white/yellow terminals for audio and video. RG-179 minicoaxial cable for video wiring. Only 2 mm. diameter. BNC male connectors crimped on both ends for connection to cameras, monitors, DVR etc. BNC preassembled cables are available in 4 standard sizes: 3,10,50,100 m. Nevertheless, DSE can produce upon request any special cable lenght. Please specify in the comment field of your order if you need your cable to be shorter that the standard lenght. For example you can order RE-CT5 and get it 42 m. instead of 50. Pay attention that ordering a shorter cable do not reduce the price of the product. DSE developed a full range of high quality cables for professional CCTV systems. The quality of the cables is essential in CCTV because using a cheap, low quality coaxial cable is the most common cause of poor video signal. Bad cables can spoil the quality of all other components, including high-resolution cameras and monitors. DSE cables are developed to reach the best performance possible in analogue wiring with the lowest attenuation level. All DSE cables have SOLID COPPER inner conductor with over sized section. This is very rare in the today's market, because most manufacturers tend to use small section conductors made of CCS (copper clad steel) due to the high cost of copper. Using CCS cables in CCTV systems is the most common cause of video quality problems. The braid is made of aluminum alloy with 95% coverage in order to provide extra protection against external interferences. The outside jacket is made of extra-flex PVC in white color. Video signals from wired cameras are usually transmitted using 75 Ohm coaxial cables. The most commonly-used type of cable is called RG59, and transmits video signals up to around 200 m. (for further details see tutorial). For longer distances the use of larger, more rigid coaxial cable such as RG11, which was once common, has now been replaced by the more advanced technology of twisted pair cables. DSE RG59 cable has an external diameter of 6 mm and comprises an inner core which carries the signal and a double protective external jacket in aluminium. It has an external covering in white PVC which is extra flexible for ease of laying. For the terminations male crimp-on BNC connectors (Ref. No. DSE RE-BNCCR1) are usually used. These are inserted directly into the camera, monitor, quad, etc. The tutorials section contains useful information on CCTV cabling using coaxial cable. This is an all-in-one cable which carries two separate wires. It contains an RG59 coaxial cable like the model CV-RG59 and four 0.5 mm conductors which can be used, for example, to carry a DC power supply, transmit an audio signal or controls. External diameter of jacket 6+5 mm. White colour. External diameter of jacket 2.5 mm. White colour. Combined cable including 1 mini-coax RG179 (see above) for video, plus 4 x 0.5 mm copper cables that can be used, for example, to carry DC power supply, audio signal or controls. A single PVC jacket contains all cables. The outside diameter is 6 mm., just like a single RG59.White colour. This coaxial cable differs from the previous model in terms of impedance (50 Ohm), and its protective sleeve (in double-weave copper mesh). It is used to connect aerials, as it guarantees low signal attenuation even at high frequencies. It is recommended for use with antennas for transmitting Audio/Video signals. For the terminations, male crimp-on SMA, F or N type connectors (Ref. Nos. DSE RE-SMACR1 RE-FCR1 RE-NCR1) are usually used, depending on the device to be connected. These can be inserted directly into the camera, monitor, etc. In the accessories section you will also find ready-packaged RG223 cables in lengths of 1.5 and 10 metres, complete with connectors. External diameter of jacket 5.3 mm. White colour. This cable features 4 pairs of cables twisted together inside a jacket which is only 4 mm in diameter. It is widely used for LAN computer networks. By using the DSE twisted pair cable converters RE-BNCRJ1/2 these cables can be deployed to conduct video and audio signals from cameras over a long distance (up to and over 2 km). Each twisted pair can carry a video signal, which means that with a single CAT5 cable you can wire up to 4 cameras. Twisted pair cable will also carry RS485 control signals from Speed-Dome DSE cameras, which makes it an ideal cable for these devices: one cable carries the video signals and controls from 2 cameras. 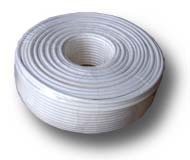 CAT5E UTP cable is supplied in 100 metre coils, the minimum quantity, in white. In the tutorials section you will find a technical explanation of wiring using twisted pair cable, while clicking on the next link will take you to the product information sheet on signal transmission converters. External diameter of jacket 4 mm. White colour.